Taille de cet aperçu PNG de ce fichier SVG : 800 × 465 pixels. Autres résolutions : 320 × 186 pixels | 640 × 372 pixels | 1 024 × 595 pixels | 1 280 × 744 pixels | 1 020 × 593 pixels. This image is based off this image from Wikipedia, which in turn is based off this image from the Commons. actuel 19 avril 2019 à 05:20 1 020 × 593 (33 Kio) BippyTheGuy Corrected West Virginia's EV count from 6 to 7. 3 novembre 2018 à 11:10 1 020 × 593 (39 Kio) BippyTheGuy Reverted Iowa to 9. 28 août 2017 à 02:18 1 020 × 593 (128 Kio) BippyTheGuy Corrected Iowa's electoral vote count from 9 to 10. 15 janvier 2017 à 06:05 1 020 × 593 (121 Kio) Inqvisitor Reverted to version as of 19:30, 4 May 2009 (UTC) Purple is used for ties between red and blue, not useful for third parties. Has no real association with Wallace 68. 7 novembre 2016 à 05:11 1 020 × 593 (121 Kio) Prcc27 Purple is the official color of the American Independent Party. 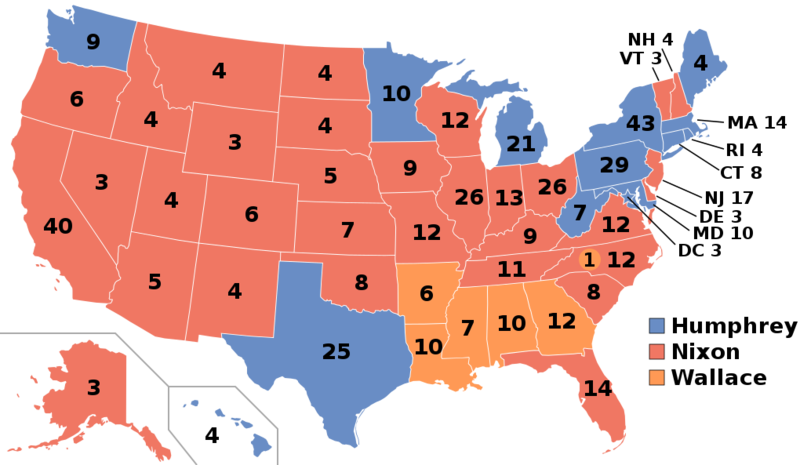 Ce document provient de « https://fr.wikipedia.org/wiki/Fichier:ElectoralCollege1968.svg ».